How many kids can a doe feed? 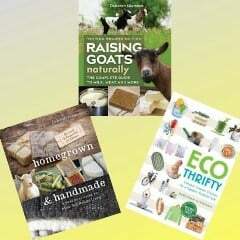 I never say “never,” but I will say it is highly unlikely that a doe can adequately nourish five kids. This is a Nigerian dwarf, and when bottlefeeding kids of that breed, they need 24-32 ounces per day. Multiply that times five, and a doe would have to be producing 120 to 160 ounces, which is more than a gallon a day! The only does that even come close to producing that much are the ones that have placed at the very top of the milk test lists, which means that less than one percent of does would be able to produce enough milk to feed five kids. Quads are fairly common with Nigerians, and unfortunately a lot of does do not have the genetic capability to feed that many. Again, do the math. Four kids multiplied by 24-32 ounces a day is 96 to 128 ounces — or three to four quarts a day! My best milker in her prime peaked at 6 to 6.5 pounds a day, so she would have produced enough milk to feed four kids, but based upon milk test lists that I have seen, I would assume that only about 10-20 percent of does can produce that much. And remember, that was in her prime. What if a first freshener or a nine-year-old doe has quads? However, the doe’s ability to produce is only part of the equation. The doe’s temperament and the kids also play an important role. Goats only have two teats. Because does have to be standing for kids to nurse, that means a doe with four kids will have to spend twice as much time standing as a doe with only two kids. Some does simply do not have the personality to do that. Having only two teats also means that bigger, stronger, and pushier kids have the advantage. 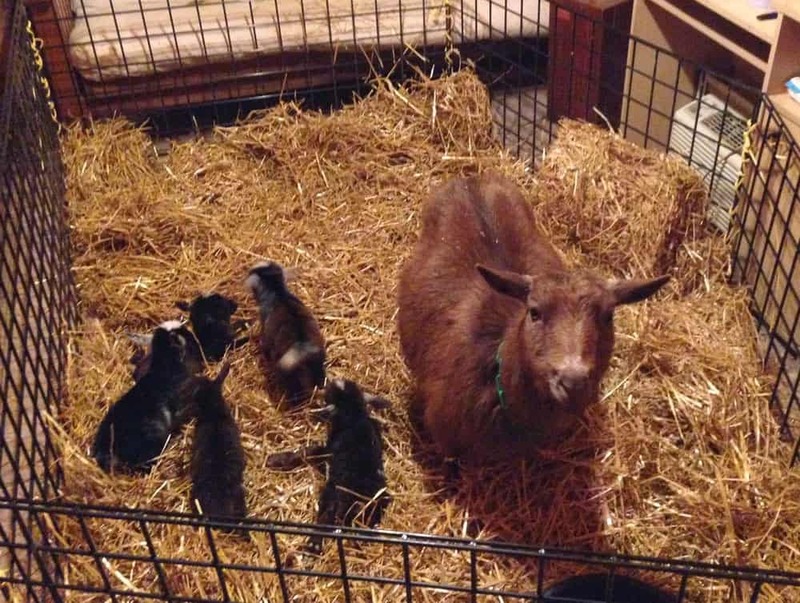 Baby goats want to nurse all the time, so if their mama is standing, they think they should be nursing, and they will not hesitate to knock a sibling off the teat so they can nurse longer. When a doe has more than two kids, it is not unusual to have a runt, and the poor little thing will not have a chance. When we had our first set of quads in 2004, we naively assumed that the doe would feed the kids, even though one of them was much smaller than the other three. At two weeks of age, my daughter found the smallest kid almost dead. We wound up having to tube feed her to bring her back, and she became the second bottle baby ever raised on our farm. Unfortunately that was not the last time I over-estimated a doe’s ability to feed quads, but I did eventually learn. With our last set of quintuplets, we watched the kids nursing several times a day, weighed them, and offered them a bottle of fresh milk from another goat. Within two days, one of the quintuplets had completely given up on trying to nurse from her mother. When we would walk into the barn we would see her standing there with her head and ears hanging down while her four siblings were fighting over the two teats. We began bottlefeeding her exclusively, and when one of her sisters had gained only 8 ounces by two weeks, we switched her to a bottle also. Her siblings had all doubled their weights by then, which meant gains of 3-4 pounds each. Clearly she was not able to get her fair share of the milk! We had been trying to give her a bottle for those first two weeks, but like some kids who still have access to mom, she was completely refusing to take the bottle. So, at two weeks we had to take her away from mom and spend a lot of time getting her switched to a bottle. Today, I would not wait that long to take a kid away from mom if it was not on track to double its weight by two weeks — or at least be very close to that target. Over the years I have become increasingly skeptical about the ability of does to raise more than three kids. Unfortunately there are quite a few people online who happily share that they had a doe raise four or five kids. However, I also see a lot of sale ads that say a kid is small “because it was a quad.” Being a quad is not a reason for a two- or three-month-old kid to be small. By that age, kids are small because of genetics, parasites, or not getting enough to eat. Nigerian kids can survive on about 16 ounces of milk a day, but they don’t thrive. They grow slowly because they are not getting enough protein and calcium, and they have lowered resistance to parasites and disease because they are not getting enough antibodies from their mother’s milk. Although I am not a fan of bottlefeeding, I would much rather bottlefeed one or two kids from a litter of four or five than wind up with sickly or dead kids. 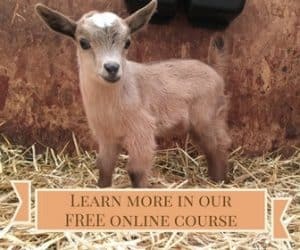 If you want more information about my goat birthing course, click here. Hi Deborah! Quintuplets! That's amazing! Our Nigerians are due to kid in July, first time. I'm hoping they'll have only one or two at the most! I will surely keep this post in mind if they have more! Thanks for sharing! Blessings from Bama! I have never seen quintuplets before. 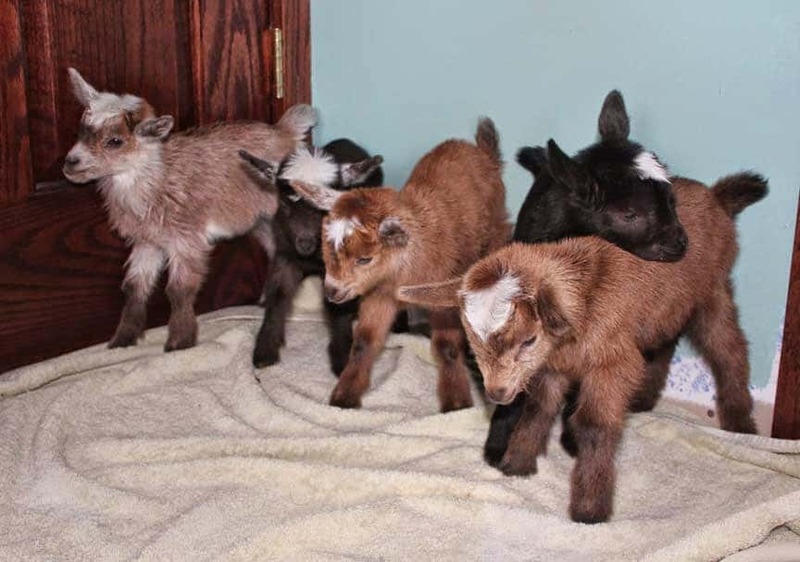 My dad has raised goats for years and I am quite sure the most he has ever had (and only once to my memory) was quads. With the quads one did have to be bottle fed. We happily live near my parents so we have been enjoying their baby goats and their extra milk! My dwarf Nigerian had triplets and I bottle fed the tiny one. 1.5 pounds at birth – she never would have made it. Brother and sister were 3.5 and 3.7 pounds each. Now she is hale and hearty, and doing great. Font hesitate to pull a baby and bottle feed / they need that extra care. So glad you shared this! Yes, it’s very important to take the kid’s size into consideration. A kid that tiny can’t compete for those two teats. Wow, quintuplets! Last year one of our does had quadruplets. The year before she had given birth to triplets, and she had a hard time feeding those – she got skinny and we had to make some changes to what we were feeding her. We were worried when we saw three babies pop out, and then all of a sudden there was a fourth! We were very lucky though – one of our other does was giving birth at almost the same time, so as soon as the fourth kid was born, we picked it up and put it right in with the other mom. She took to him great and it worked out great for both moms. I hope she doesn’t have so many this year! !